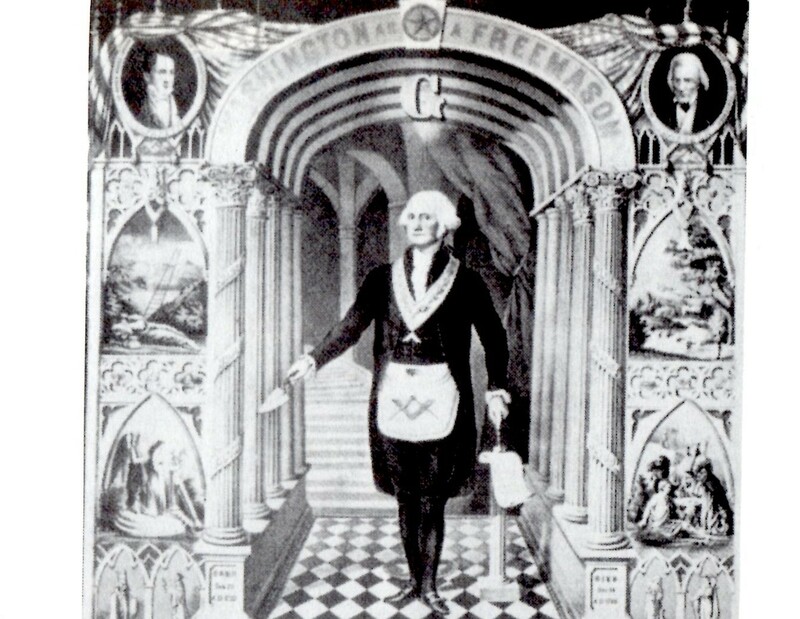 Image: Founding via Masonic cornerstone ceremony of the Federal City, now Washington DC, April 21, 1791 "...at precisely 3:30 pm" (Ellicott) when Jupiter Rx @22Vir38 was rising along with America's natal Neptune (which veils President Obama's natal Mars). Mercury-ruled Virgo, sign of The Virgin, is a prominently emphasized Zodiac sign and constellation across the District of Columbia and appears in horoscopes of various cornerstone laying ceremonies of buildings and monuments across the city including that of the executive mansion (lodge) we now call the White House. 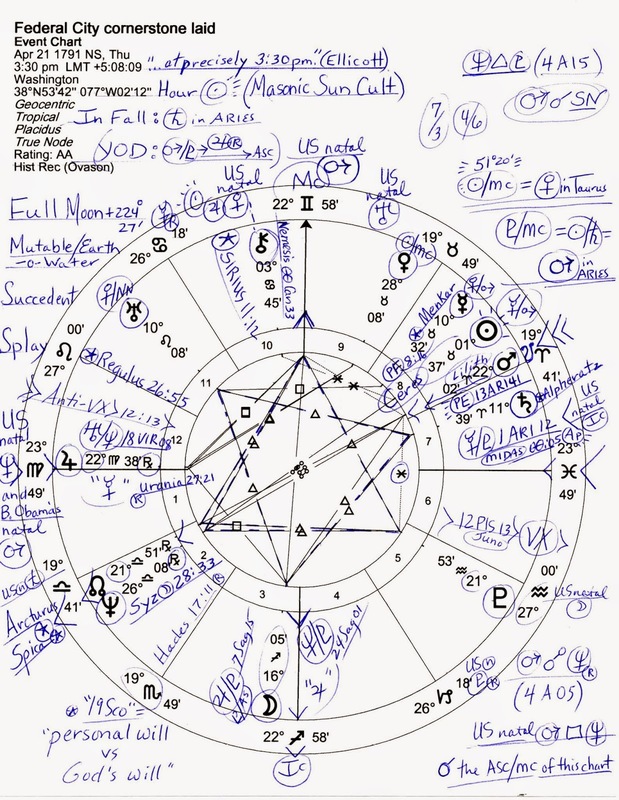 In the horoscope, chart-ruler (and goal-oriented Midheaven-ruler) Mercury makes no major applying aspects to other planets so its sign, house, and degree are spotlighted (10Tau32 in the occult 8th house conjunct star Menkar...victim of the unconscious and associated with Cetus the Whale). Please enlarge the image to read a few basic chart factors for they are not discussed here. If we look to the stars of the ancient constellation Virgo for clues to the nature of our capital city, we find that the Virgin was called Demeter by the Greeks, Ceres by the Romans, and on April 21, 1791, the Sun @1Tau37 (8th house) conjoined asteroid Ceres, goddess of the harvest. 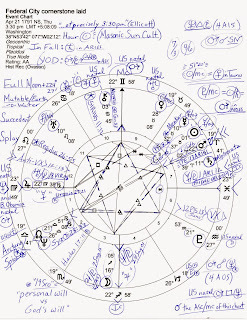 Spica is the alpha star of Virgo, and is represented in the Federal Triangle by the phallic Washington Monument, part of the Founders' Solar Cult in which George Washington was allegedly deified. Spica ('the spike') is linked with the wheat sheaf in the hand of the goddess (our Founders were pagan goddess worshippers as you may know by now!) 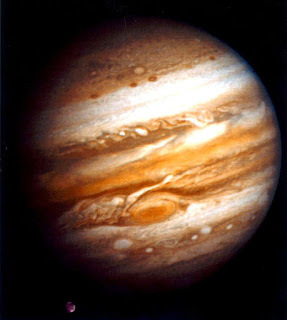 and was considered a symbol of her gifts to mankind of harvest, bounty, knowledge and wise insights. That's supposedly George all over according to his contemporaries. 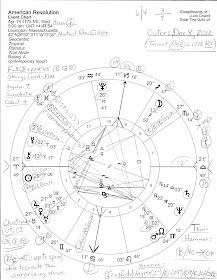 Of course there is much more to say concerning this horoscope, the circumstances in 1791, and the stars and planets thereof but I shall leave you to be curious enough to check things out for yourself--if indeed you are curious at all. Recommended reading: David Ovason's The Secret Architecture of Our Nation's Capital.